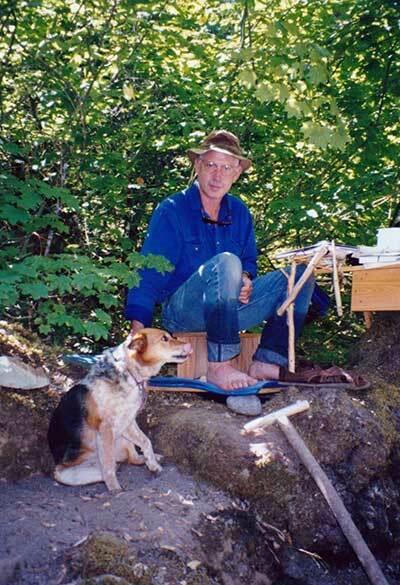 Marshall Cutchin: Every spring for 14 years, Lee Spencer and his companion, a herding dog named Sis, camped next to a pool on the North Umpqua’s Steamboat Creek. Their job for eight or nine months of the year was to protect several hundred wild summer steelhead. The fish had come up out of the Pacific Ocean to spawn in the pool. 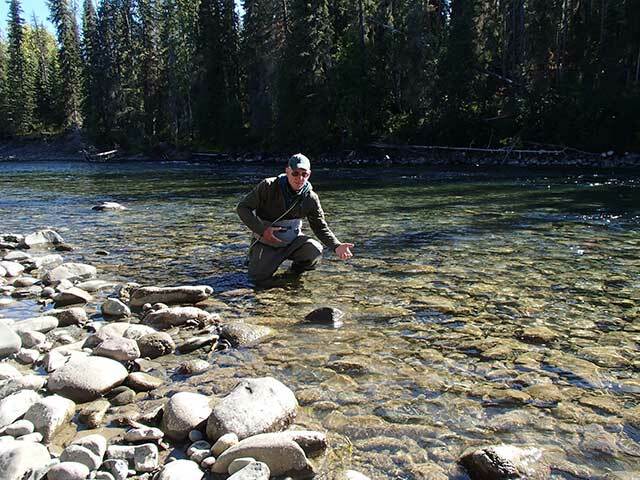 Over those seasons and four more, Spencer has observed and documented the behavior of these steelhead and the many other species, both animal and plant, that visit or inhabit the locale from spring through early winter. He’s just finished a book about the experience entitled A Temporary Refuge: Fourteen Seasons With Wild Summer Steelhead, and we were lucky enough to get an advanced copy, which we started reading a couple weeks ago. We’re very lucky, also, to have Lee on the phone with us today and get to ask him a few questions about the book. Welcome, Lee. Lee Spencer: Thank you. It’s a pleasure to be here. Marshall: I have to say that I began reading your book as I was flying to Florida on a fishing trip and I honestly could not put it down until I was finished. It’s got so many fascinating details, not just about steelhead but about the whole ecosystem up there and also just an incredible number of anecdotes about life in the wild, that only a person who spent eight or nine months a year alone in the wilderness could possibly come up with. Really, really fascinating stuff. The first question that I think comes to mind about the book is about steelhead themselves and what it is about steelhead that makes them so fascinating or so interesting not just to observe but to, I guess, think about in the context of all the other stuff that’s going on around them? Lee: That’s a hell of a good question. The answer to it, to a certain degree, I think almost any question really has to come down to the fact that a steelhead is an ocean-run rainbow trout. By going into the ocean, they have access to 10 times the amount of food that’s usually carried in a freshwater stream or river or lake. In the case of the summer steelhead on the North Umpqua, the average fish is eight pounds and 28 inches long, and that’s a nice fish. Marshall: Yeah, I think you pretty much covered that the beauty of the place attracts all kinds. You were tasked with a sort of a protector’s role trying to stop some of the human behavior that was happening, that was interfering with steelhead up there. I think that was mostly to do with poachers who were actually dynamiting the area, right, or the pool? Lee: Yes. At the most extreme, they were dynamiting it. Of course, when the basin had just been opened up in the early 50s for logging and logging roads were in use—and there’s a logging road that goes fairly close to the pool—there was nothing to stop people. Because logging had just begun in that area, in the middle and upper portions of the stream reach that the pool that I sit at is located in, there was a lot of road building going on and there were a lot of powder sheds around. There was ready access to blasting caps and quarter sticks of dynamite and you name it. But without question, or rather and without question, for every dynamiting, there were probably 15 or 20 different snaggings or other things of that nature that were going on. These people seemed to be able to justify to themselves the sort of mayhem that they were doing. I’ve had lots of talks with now old-time loggers who said that they could tell when they were driving up to work when the pool had been blown because there’d be belly-up white bellies of fish showing in the stream for a mile below where the pool is. It was wholesale mayhem. Now, it had declined slightly but there was still a lot of it going on when the fish watch began. 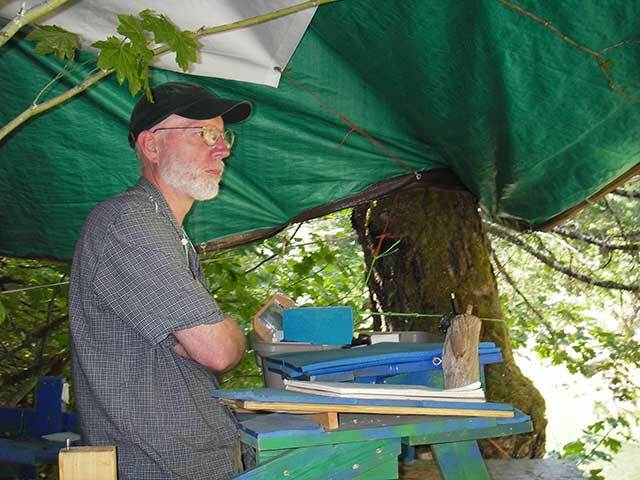 I like to think of the North Umpqua Foundation, the outfit that I work with, as a primary player in the initial setting up of this fish watch effort and also in later on, taking it over and making it possible for a person to spend eight months of the year if he so chose to do. They way they did that is they offered a per diem amount, which allowed me at the outset, anyway, to sit up there and not worry about doing archaeology, which is what my regular work was at that time. Marshall: Well, I’m just thinking about you taking on this role as someone up there who is not just observing the fish but interacting with people who basically—some of them want to continue doing the same old, same old—that you must have had a little bit of trepidation at least about being up there by yourself in the wold and possibly in confrontation with some of these people. Lee: Actually, that never really occurred to me. As an archaeologist, I’d spent long months for 20 or 25 years in the field doing archaeology in Bumfuck, Nowhere. That kind of made me very comfortable. I mean, I’m very comfortable outdoors and sitting with my dog and just kind of enjoying things. It took me very little time to realize that [I was doing part of my job by] simply by being there, having that first year with my tent camp set up, my old Chevy pickup parked there and people coming and going from the pool, visitors, people who wondered what the guy is parked on the side of the road for, and that sort of thing. Marshall: Was it what you expected it to be? Lee: No, no. I did it with no expectations. I had been volunteering with a number of, maybe a half a dozen other people who regularly volunteered for a day here, two days there, to cover the pool. The North Umpqua Foundation realized that what needed to happen, both organizationally and in reality, was to have one person there most or all of the time, so they made a per diem available to people who spent 12 of every 24 hours at the pool. I can think of nothing more enjoyable than sitting down and watching some wild creatures, particularly steelhead, which are a rich part of my life and have been and will remain. The poaching is a difficult thing to understand and it took me, I think, a long time to realize these are not evil or malicious people, probably. They’re simply people who are not aware of the consequences of their actions. You can fault people for that, but I think that’s a waste of time. A better way to go would be to just have a conversation with somebody. Marshall: Well, your demeanor, at least, as it’s portrayed in the book, is pretty diplomatic. You apparently have run into all different kinds of people with different intentions. Lee: Yes, that’s true. But far and away, 99 percent of the people are just delighted to see the fish. They might be confused and ask some fairly interesting questions, but … This is now, the upcoming year is going to be my 19th year at the pool and I have no qualms about saying that there are far, far more people in the Roseburg area who are interested in the conservation of steelhead than are interested in poaching them. That won’t stop a poacher from poaching. There is poaching that goes on in Steamboat Creek now, but it amounts to possibly something like two or three fish a year, and the wholesale dynamiting of the pool with five or six hundred steelhead in it no longer happens. Now, I’m confident that it would begin again if when I stop sitting at the pool. No one else sits there. I’ve made it abundantly clear and people—many of them are already aware of this—that there has to be a human presence at the pool. Now and for the foreseeable future, it’s just the way it is. But it’s not because most of the people in the area hate steelhead or want to eat them or barbecue them or something like. It’s just because there’s a small number of people who can justify that to themselves. I think, you know, that’s my interpretation of facts. Marshall: You’re a lifelong angler, steelhead angler. Lee: Not a lifelong steelhead angler. 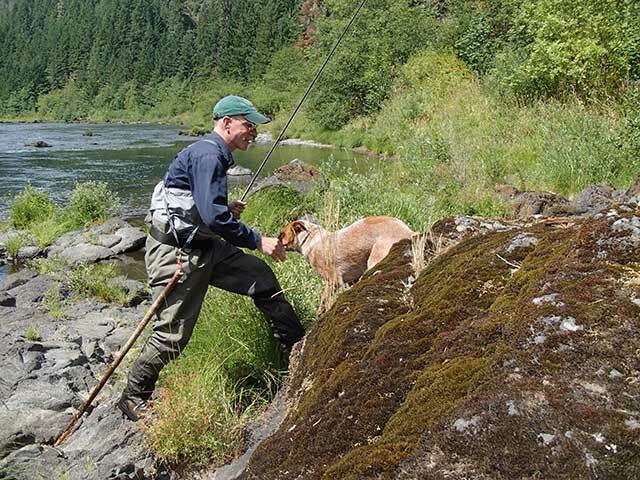 I’m a lifelong angler but I didn’t pick up my first fly rod until I was 30 years old. Then I spent seven—actually this is amusing—I spent seven years fishing in North Umpqua before I caught my first steelhead. That was time very, very well spent. I don’t begrudge it at all. Marshall: How do you square angling with this, what seems to be an increasing concern about the future of steelhead? Lee: Well, there are lots of ways you can attempt to square it. Potentially if you have a fly rod in your hand, your attempts at squaring it are going to be half-assed anyway, you know? I don’t mean to put anybody down when I say that. For myself, over the winter before my first season on the pool, which was 1999, I had risen something like 77 steelhead the year before. I’d killed 3 fish I hadn’t intended to kill and I brought a steelhead eyeball in on my hook, and that convinced me that I had to have a lighter impact on the fish. The number of fish I’d caught made it clear to me I didn’t need to confuse myself that I didn’t know how to do it—how to fish for steelhead. So at the urging of my niece, who I was having a conversation with, she said, why don’t you just take the points off your hooks? So the next year I went to the pool, that was the first year, ’99, that I sat at the pool, I clipped all the points off my hooks and I’ve never fished with a hook point on any fly that I’ve fished in the last 18-plus years. That has meant that my average hook-up period of time is a second or two, but it’s everything I want. It’s all I need. For some reason, just some sort of minimal contact is enough. Marshall: You seem to have discovered a lot of things about steelhead that you didn’t know, though, at least being different than you experienced as a person that just went out with a fly rod and fished for them, right? Lee: That could be the understatement of the century. I went up there with what I thought was a fairly robust and rich appreciation for steelhead, and it took my several years to finally realize that what I had learned with a fly rod in my hand was almost inconsequential compared to what I was seeing while sitting. Now, understand, when you have an opportunity to sit over a pool that’s crystal clear that you can count the scales on the fish, that has three to seven hundred fish in it, all of them wild, and they’re at most 50 feet away from you, you can see behaviors that, again, several hundred fish … you can see behaviors that otherwise would be rare that become relatively common. The thing that above and beyond all other things, Marshall, that I’ve come to appreciate about steelhead is that they are, I am completely convinced, completely aware of the world around them. Outside the water, inside the water, above the water, below the water. They have a tendency to interact with the substrate very interestingly. They are, I’m convinced, far, far more aware of what’s going on around them than probably we are, or that I am. Marshall: There are some astonishing anecdotes that you relate. One in particular I’m thinking of now, and I apologize if I don’t recall the details correctly, but you were getting your drinking water from a small tributary that fed into the pool. You had gotten so familiar with the behavior of the steelhead in the pool that you realized even walking upstream in the tributary and gathering that water had an actual influence on their behavior, which I guess you attributed to smell, right? Lee: Yeah, yeah. It took me far too long to become aware of that. I was into my second or third year before I finally realized that when steelhead get spooked, they have a very uniform way of making it apparent that they’re getting more and more nervous. When the final spooking event fades away, they also go through a series of regular changes in their behavior to settle down and relax again. As an example last summer I noticed the fish in the pool gathered into a small group and started a continuous daisy chain, which is continuously swimming in a counter clockwise fashion at a lower-than-usual part of the pool where they do that. When I see that, I walk up and look up and down the creek. In this case, there was a dog in the creek quarter mile away. Those fish were just completely aware of that dog. I don’t know what the distance would be that they wouldn’t be aware of the dog, but [it’s remarkable] when you consider that steelhead, which is an ocean-run rainbow trout and now is considered to be a Pacific salmon, migrates from the ocean to the headwaters of streams to spawn. There are some rivers, for instance, I believe the Yukon in Alaska is one of them, where some Pacific salmon will travel more than a thousand miles to find their same spawning gravels. While it remains actually somewhat obscure—if not quite obscure—everything that’s involved in the ability to find their native gravels where they were laid as fertilized eggs, it is clear that scent has a great deal to do with it. So the fact that a quarter mile away a dog can go into the pool and go into the creek above the pool and scare them, or that I can dip my fingers for no more than five seconds, the tips of them, in water 200 yards above the pool, where the fish are, and the fish will respond profoundly. Marshall: You determined that what they’re really doing when they’re jumping is looking around, which is amazing. Lee: Yes. Yeah, it is. The fact of the matter was, again, I watched these things for two or three years before I started even getting inklings, you know. My observations were … sometimes I’d come up for reasons for things in the first year or two that turned out to be just idiotic later on, but the jumping thing was fairly clear. Number one, I see probably over 2,000 jumps from steelhead a year, and in only two cases have I seen a steelhead jump with his mouth open. So their mouths are closed when they jump. They’re looking at a particular direction. In my second year, I started making notes not only on fish jumping, but which way they were facing. It turned out that by the end of the season, I had enough data to show that in about 30 percent of the cases—just estimating there blindly—but in about what seems like 30 percent of the cases, the beaver, otters, person, dog, you name it, was coming from the direction that the steelhead was facing when it jumped. Sometimes they face the bank, sometimes they face upstream, sometimes they face downstream, or in angles of those. There is, as far as I’m concerned—I’m as sure as I can be of anything—that jumping is primarily for the purpose of getting their heads above the water and to be able to see outside. I’m not going to dwell on this but your listeners might want to look something up, it’s called “Snell’s Window.” Just look that up in Wikipedia or something else and you’ll find something that applies directly to why steelhead jump if they want to see something outside the water. Marshall: I don’t want to jump directly to the conclusions of the book, either, but I would like to get you to talk a little bit about what you see as the challenge of the industrialized consciousness, which you describe later in the book. I’ll just read a little passage from there, because it really is beautifully written and, I think, the message is so important. I realize I’ve stolen your line, there, to a degree. Lee: Oh, actually, listening to you read that, I’m impressed with my writing. Marshall: Well, I think you build a case in the book that the existence of steelhead is something of a miracle, in and of itself, and that its incredible complexity, which is not easily understood, certainly not to the casual observer, is the thing we stand to lose, if steelhead go away or if any other species so intricately dependent on its environment is lost. I don’t want to put words in your mouth. Maybe I’m reaching a little bit too far, there, but you certainly seem to be saying that this just can’t be gathered in a couple of months of observation or in a little bit of narrow scientific study. Lee: Yeah, I think that is true. However, I don’t know what an initial or what, sort of limit, or at what point in time in your watching steelhead and trying to be aware of observational bias and so forth, how many months will it take to see that, see that you’re confusing yourself or not really paying attention to things the way you should be paying attention. Well, this is, I think, off the path of where you were going. I think that that sort of thing will depend on the individual person. But in terms of industrialized awareness, we’re surrounding ourselves with it, any time we try to simplify things. Simplification I think is actually a matter of complification, if that’s a word, more than anything else. The classic example of that is the fish hatchery. That is the most dangerous…. Marshall: That’s where I was going. Yes, absolutely. Lee: Fish hatcheries are without question the most dangerous, oh gosh, most dangerous thing that wild populations of salmon can ever encounter. It beats the problems of dams, of beaches. It beats everything. It’s because when you start messing, you start spawning fish in buckets and putting them in streams and things like that, you are simplifying the gene pool. You can’t even say that hatchery fish has a gene pool like you can a wild fish. A hatchery is a simplification on the level that it overlooks the fact that your average steelhead is born in the headwaters of a stream, spends a few years in fresh water, then smolts up, goes into the ocean, changing its metabolism, for chrissake, to be able to deal with the differential amounts of oxygen in the water. They’ll spend a very little amount of time in the ocean, then it will come back, swim upstream to the place it spawned, and spawn again if it finds another willing partner, hopefully a wild willing partner. That is an extremely—I mean, it’s fairly glib of me to speak about it like I just did—but that is a life cycle that is as complex as any that I know. You just can’t bastardize it. You can’t change it. You can’t do anything with it. You should just let the fish do what they’re going to do without giving them carbon-copy buddies that don’t know what to do with life. Marshall: I think your point in the book where you’re talking about the essential role of the death of spawned-out fish to the young steelhead is a great example of that complexity that’s so essential to what’s going on. Lee: Yes. There is an example of a guy, a researcher, I can’t give a name but it is a Canadian researcher on, I believe, Carnation Creek on Vancouver Island, who got a photograph of a deer eating a salmon carcass. When you start thinking about all the creatures that take advantage of these marine-derived nutrients that have been channeled up into the headwaters of streams, I’d be hard pressed to talk about any organism that isn’t getting some benefit from that. Any organism in a given drainage basin that has good populations of fish. Marshall: Conveyor belt, that’s what I was looking for. Lee: Conveyor belt, good one. Marshall: Yeah. That that nutrition couldn’t possibly get that deep into the landscape without steelhead as a vector. Lee: Exactly. My compliments to you, Marshall, that is…. In the stumbling around I’ve been doing recently, that was a very coherent statement and a good one. My congratulations. Marshall: Well, it was completely accidental, I promise you. Lee: It usually is accidental for me, too. Marshall: Well, Lee, thank you so much for your time. I could continue talking to you about this for quite a bit longer and hopefully we’ll have a chance to do it someday. The book, Temporary Refuge: Fourteen Seasons With Wild Summer Steelhead, is being published by Patagonia. It’s coming out next month, [July] 2017, and I’m sure will be available on the Patagonia website as well as Amazon and hopefully in the MidCurrent store as well. Lee, thank you so much for your time.